Enjoy and Relax a huge range of fun attractions and places of interest in Great Yarmouth – it’s filled with things to see and do aswell as places to go whatever the climate on the day. The Pleasure Beach at Great Yarmouth itself is one of the East of England’s top tourist attractions, combining modern up to date rides with all the fun of the amusement park. At Merrivale Model Village, see town and country in miniature in over an acre of rolling gardens with a railway passing through it. 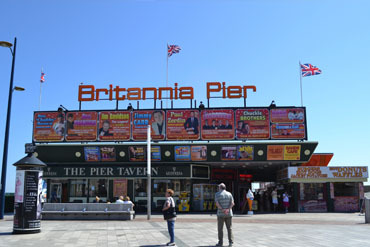 Enjoy Great Yarmouth attractions; have a go at crazy golf, have a go at rollerskating or trampolining. Chill out on the beach, ride a donkey ride, ride in landaus or climb onto a boat and go to see the seals. Visit and take the kids to Joyland, a fun theme park for the younger children or jump in the car to see lions and giraffes at Thrigby Wildlife Gardens or perhaps visit some less big animals at Pettitte. Great Yarmouth has some truly many things to see – get up close and personal with tigers at Thrigby Wild Life Gardens, get up close with sharks at the Sea Life Centre, go back in time at Time & Tide or look round the remains of shipwrecks at The Potteries. Visit Yarmouth attractions such as the seafront Marina Centre for a look in the tropical pool or go bowling on the Regent Road or Wellington Pier overlooking the sea. Whatever the weather, there’re attractions in Great Yarmouth for the whole family. Download your discount vouchers from their main website. Set in over 50 acres of coastal parkland and just 15 mins from the town of Great Yarmouth, Pleasure Wood Hills Theme Park has so much to offer and explore. Take a ride on the Mad roller coaster or jump on-board Wipeout. Get wet on Timber Falls log ride, enjoy some fun in the Kiddie Zone or just relax and watch great shows with The Sea Lions and the Crazy Parrots. They also offer a wide selection of places to eat which include an alfresco style Terrace Cafe and Bar. When they can they use locally sourced fresh and healthy ingredients for a tasty choice of food and drinks that give visitors a great value nutritious munch. So, whether you’re an adrenaline thrill ride seeker or looking for a great fun packed day out full of lovely family memories, Pleasure Wood Hills has it all, ‘Family Fun’ for all! Open from March – October 2016. Open from 10 am. All the latest prices are available at www.pleasurewoodhills.com.